Good morning from Maine where I'm mourning the loss of my big buddy Max. Max was a wonderful dog who I adopted from Harvest Hills Animal Shelter five years ago when he was two or three years old. We had many wonderful years together and I was looking forward to many more, but it was not to be. Max passed away peacefully on Wednesday afternoon. I like to think that he's now free to run and swim with again with his older brother, Morrison, who passed away just 18 months ago. I'll miss them both and remember them both for the rest of my own days. As long time readers of this blog know, I'm a huge advocate for adopting not shopping when it comes to pets. Max was a classic case of a second chance dog. Some members of the shelter staff thought he should have been euthanized, but I gave him a chance and he gave me a chance. We ended up having five wonderful years together. Please consider adopting from your local animal shelter. Just like kids, they all deserve multiple chances at a great life. 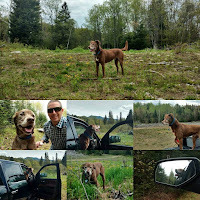 Finally, a huge thank you to the staff of Bridgton Veterinary Hospital for providing great care for Max until the very end.